Simon gave a presentation at the Anxiety and Depression Association of American annual convention in Chicago, March 2019. Simon was invited to present by Shmuel Lissek and Christopher Hunt in a symposium they organised entitled, “Toward understanding avoidance in clinical anxiety: The value of experimental choice paradigms” . Simon got to hang out with Shmuel (below, centre) and Namik Kirlic (below, left), as well as catch the mighty Chicago Fire MLS team in action! March 2019: Simon and Tori attended the 2019 Veterans’ Mental Health Conference at King’s College, London. Tori displayed a poster describing the UK Armed Forces Veterans Health and Gambling study and received a lot of interest (but sadly no poster prize)! Simon even managed to remember to bring the poster back on the train. Rhiannon Phillips MSc has joined the UK Armed Forces Veterans Health and Gambling project as Research Assistant. Rhiannon has experience conducting survey-based fieldwork with vulnerable populations, and is currently undertaking training as an Assistant Psychologist. Welcome, Rhiannon! Simon contributed to a report published by Public Health Wales on identifying area-based vulnerabilities to gambling-related harm in Wales. Read more here. Simon gave a presentation entitled “Fear and avoidance of the unknown: Derived stimulus relations and the empirical study of emotion” at the annual conference of the Icelandic Association for Behavior Analysis, in Reykjavik, Iceland, November 1-2 2018. He also got to hang out with Pat Friman (Boys Town) and Greg Hanley (Western New England University)! We’re hiring! One position is available on the UK Armed Forces Veterans’ Health and Gambling Study, for one year. There is the possibility of the role being full-time through supporting other, related research projects. Interested? Apply here. Tori Miles MSc has joined the Armed Forces Veterans and Gambling project as lead researcher. Tori brings with her a history of supporting veterans through her role as therapist with Help for Heroes and as a research trial manager at Cardiff University. Welcome, Tori! We (Lars Marstaller, Daniel Zuj, Weike Xia, and Simon) hosted and organised the 10th European Meeting on Human Fear Conditioning (EMHFC) at Hensol Castle and the Vale Resort, Vale of Glamorgan, April 16-18 2018. The anniversary meeting was a huge success, and we were honoured to organise it. You can see photos of the event here. Our FiMT-funded research on gambling problems in UK armed forces veterans was mentioned by collaborator, Matt Fossey of Anglia Ruskin University’s Veterans and Families Institute, during evidence given to the House of Commons Defence Committee on Armed Forces and Veterans Mental Health. See 12.14 minutes in here. Simon was back in his old stomping ground, the School of Applied Psychology at University College Cork, for an invited seminar talk. Shocked to realise it was almost 22 years ago that he graduated with his PhD from UCC, Simon spent most of his talk vainly trying to perfect his Cork accent, like. Thanks to Conor and the App Psych team for the invite, and cheers to Ver and Mar for representing! Tweet here. NEW! Fully-funded PhD Studentship! Want to work on a Swansea University Research Excellence Scholarship (SURES), supervised by Dr Alice Hoon and myself, investigating gaming machines and their role in problem gambling? If so, apply here. Deadline is January 22nd 2018. Catch up on Simon’s appearance, explaining the near-miss effect, on ITV Wales This Week here. Simon and Glen Dighton, PhD student working on the impact on the family of veterans’ gambling, feature in tonight’s ITV Wales This Week programme. Be sure to tune in! Simon gave an invited presentation at Third Annual Conference of the Russian Association for Behaviour Analysis, in Moscow, Russia, on September 30th 2017. His talk was entitled “Schedules, derived relations, and the behaviour analysis of gambling”. Here he is with his old friend and colleague, Dr Neil Martin BCBA. Simon attended the invited stakeholder reception, “Welsh consumers at the heart of gambling regulation’, jointly hosted by the Gambling Commission and the Directors of Public Protection Wales and held in the Senedd, Cardiff Bay. Gambling behaviour is increasingly a subject of public health and policy interest, both for the Welsh Assembly and for people across Wales. The Gambling Commission and the Directors of Public Protection Wales focused on the how to keep gambling fair, safe and crime free. Addressing problem gambling – and the wider effects it has on society in Wales and across Britain – is one of the GC’s key priorities. At the launch of the Veterans and Gambling FiMT-funded project, 3rd Excessive Gambling Wales 2017 conference with Carolyn Harris MP, Elystan Roberts (Research Assistant on the project), Matt Fossey of Veterans and Families Institute, Anglia Ruskin University (Co-Investigator on the project), and Glen Dighton (PhD student). Download the report here. More photos from the day can be found here. Read the SU press release here and a BBC Wales article about the conference here. Videos from the Public Health Network Cymru ‘Addictive Behaviour and Behaviour Change‘ seminar, held at Bangor University on May 4th 2017, at which Simon presented, are available to view here. The launch of the findings of the FiMT-funded Veterans and Gambling project will happen at the 3rd Welsh National Conference on Excessive Gambling, on June 21st. Check out the conference programme here and register (for free) here. We’re hosting the 10th European Meeting on Human Fear Conditioning in April 2018! More details here. Welcome to Elystan Roberts, who has joined the lab as a Research Assistant on the Forces in Mind Trust funded project investigating gambling in UK armed forces veterans. Elystan studied at Oxford University and worked as researcher in Cardiff University and King’s College London. Welcome, Elystan! New grant announced: Delighted to have been awarded a grant from the Forces in Mind Trust for the very first evaluation of gambling-related problems among UK veterans which will also compare the findings against non-veterans from the general population. Read the FiMT announcement and the Swansea University press release. Glen Dighton MSc. has joined the lab. Glen will be conducting his PhD research, which is funded by the Responsible Gambling Trust, on “Gambling on Civvy Street: Assessing the Impact of Gambling-related Problems on UK Armed Forces Veterans and Their Families”. Welcome, Glen! Kathrin Weidacker has joined the lab as a research assistant. For the next year, Kathrin will be working on the NCRG-funded project investigating GABA spectroscopy of cognitive control in disordered gambling. Welcome, Kathrin! Gemma and Weike presented their research at the College of Health and Human Sciences Annual PGR Conference in September 2016. For photos of them presenting, see here and here. Simon was one of the invited speakers at the 2nd Wales Excessive Gambling Conference at the Pierhead Building, adjacent to the Senedd in Cardiff Bay on June 22nd 2016. Simon presented his and his colleagues’ fMRI and MEG work on ‘almost winning’ and was part of an expert panel discussion. He also provided his support for the Wales launch of the All Party Parliamentary Group on Fixed Odds Betting Terminals, chaired by Swansea East MP, Carolyn Harris. Here’s a SU press release and here’s a link to the conference site. Here’s a link to coverage of the event from ITV Wales. Follow the Beat The Odds support group here. Research Assistant post just advertised: click here. Deadline: July 8th. Simon, Gemma and Weike recently attended the 8th European Meeting on Human Fear Conditioning held at Amersfoort, The Netherlands, from April 18-20 2016. Gemma (below right) presented her work on category typicality effects in avoidance generalization, conducted in collaboration with Joey Dunsmoor of NYU, and Weike (below left) gave a poster describing her data on effects of avoidance reliability on resistance to extinction, conducted in collaboration with Bram Vervliet of KU Leuven. Simon chaired a symposium on fear generalization. Roll on Hamburg in 2017! GRANT SUCCESS! Simon and Frederic Boy have been awarded a seed grant from the US-based National Center for Responsible Gaming (NCRG) for a one-year project entitled, “Neurochemistry of cognitive control in gambling vulnerability“. A research position will be advertised soon. 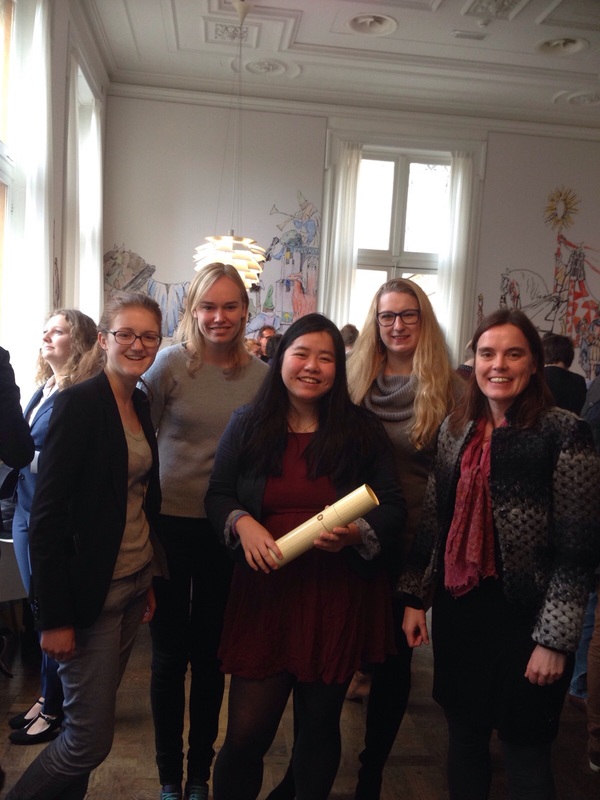 Congratulations to Weike, who graduated with her Masters in Neuroscience & Cognition from Utrecht University in December 2015. Here’s a photo of Weike (centre) with her advisor, Associate Professor Joke Baas (right) and colleagues. Simon and Mike Schlund’s neuroimaging research on approach-avoidance conflict and the anterior cingulate was presented at the Society for Neuroscience meeting in Chicago. The poster (K8 503.9) was very well received, leaving Mike very busy! New Lab Member: This week, the Lab welcomed Weike Xia MSc, who has commenced her university-funded PhD on safety behaviours and overgeneralisation. Weike recently completed her Masters in Neuroscience & Cognition at Utrecht University, The Netherlands. Welcome, Weike! New Publications: Congratulations to PhD students Katie Still and Gemma Cameron on having their work recently accepted for publication! Katie’s study on facilitating untrained requesting skills in children with autism was published in Research in Autism Spectrum Disorders as part of a forthcoming special issue on derived relational responding. Gemma’s work on generalised avoidance and pathways to fear and avoidance was published in Frontiers in Behavioral Neuroscience (as part of an invited research topic on avoidance learning and psychopathology) and in Journal of Behavior Therapy & Experimental Psychiatry, respectively. Miriam Lommen and Simon are presenting their funded research project (A pilot study of brief therapy for reducing overgeneralization of fear through solution-focused discrimination training) at the European Brief Therapy Association (EBTA) Conference in Vienna, September 12th 2015. Simon is presenting with colleagues from KU Leuven and University of Utrecht in a symposium entitled, “The Avoidance Paradox: When Protective Actions Foster Fears In Humans,” at the 27th APS Annual Convention, May 21-24, 2015 at the New York Marriott Marquis in New York, NY, USA. Prof. Elizabeth Phelps of New York University is the discussant. Simon is presenting in a symposium on “Rule-based generalisation: from animal research to experimental psychopathology” at the International Convention of Psychological Science, Amsterdam, March 14th. Further details here. Great news! Miriam Lommen (University of Oxford) and Simon have been awarded a grant from the European Brief Therapy Association for a project entitled, A pilot study of brief therapy for reducing overgeneralization of fear through solution-focused discrimination training. They have been awarded €3500 to conduct and disseminate the research. Well done! Fully funded PhD studentship opportunity available from October 2015! A funded studentship (tuition fees, plus annual stipend) is available on the topic of ‘Safety behaviours and overgeneralisation’. The aims of this studentship are to develop and validate a lab-based tool, implemented in virtual reality, of the overgeneralization of safety behaviours, to test group differences in safety behaviour generalization in those with and without an anxiety disorder, and assess the degree to which maladaptive safety behaviour can be reduced via a brain stimulation intervention. We will record physiological arousal (skin conductance responses, SCRs), electromyography (EMG) of expressive facial muscles (fear-potentiated startle, FPS), cognitive fear expectancy ratings and avoidance behaviour. This studentship provides funding for three years, full time study only. A stipend of £13,836 is paid and all course fees are included. The successful candidate will be expected to contribute to undergraduate tutorials, practical demonstrating and assessment.